1. BECKETT BROKE LITERARY RULES BY WRITING BOOKS WITHOUT CHARACTERS AND PLOT. Considered one of the last Modernists, or sometimes the first Postmodernist, Beckett wrote novels and plays with minimal characters, plot, and scenery. Dubbed “Theatre of the Absurd,” Beckett’s plays—such as his most famous, Waiting For Godot—pessimistically portray the human condition as one that is hopeless and meaningless. The minimal characters and plot reflect this bleak view of life. 2. HE BEFRIENDED JAMES JOYCE, BUT THE TWO WRITERS HAD A FALLING OUT. In the late 1920s in Paris, Beckett worked as writer James Joyce’s assistant, helping him transcribe and do research for Joyce's novel Finnegans Wake. Beckett greatly admired Joyce, and in 1929, he published an essay defending Joyce’s work. Joyce’s daughter, Lucia, had a crush on Beckett, but he didn’t return her feelings, and the unrequited love reportedly ruined the friendship between Joyce and Beckett. As a student at a boarding school in Northern Ireland, Beckett was a talented cricket player. When he was 20 years old, he even played a few games for the Dublin University Cricket Club. But his love of sports wasn’t limited to cricket. Beckett was also a lifelong tennis fan who both played and watched tennis matches on TV. 4. … AND HIS WRITING INSPIRED A TENNIS STAR’S TATTOO. 5. ENTREPRENEURS ALSO LOVE THAT QUOTE. With the rise of startup culture, business owners have looked for pithy quotes that offer quick advice and motivation. Beckett’s words from Worstward Ho—“Ever tried. Ever failed. No matter. Try again. Fail again. Fail better.”—have ironically become a popular motivational quote. Although Beckett was focused more on nihilism than self-help, entrepreneurs such as Richard Branson and Tim Ferriss have referred to Beckett’s “Fail better” quote. 6. HE DROVE ANDRÉ THE GIANT TO SCHOOL IN A BIG TRUCK. 7. HE FELT THAT HE HAD NEVER BEEN BORN. 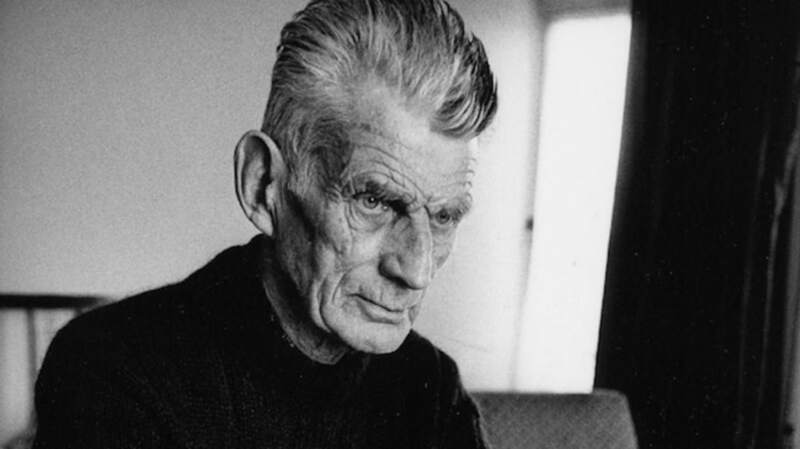 After his dad died in 1933, Beckett experienced night terrors, stomach pain, and depression. He became a patient of Wilfred Bion, a British psychoanalyst, for two years. During this time, he attended a Carl Jung lecture where Jung discussed a girl who had never really been born, an idea with which Beckett identified. He reportedly told close friends that he felt the same way, and much of his work explores themes of alienation, existentialism, and emptiness. 8. HE FELL IN LOVE WITH HIS FUTURE WIFE AFTER BEING STABBED BY A PIMP. In January 1938, a pimp on a Paris street stabbed Beckett, perforating his lung and seriously injuring him. A tennis acquaintance of Beckett’s, Suzanne Dechevaux-Dumesnil, heard about the attack and visited Beckett regularly in the hospital during his two week stay. He and Suzanne, who was six years older, fell in love, lived together for many years, and eventually married in 1961. She died in July 1989, and he died a few months after his wife, in December 1989. 9. HE FOUGHT AGAINST THE NAZIS AS PART OF THE FRENCH RESISTANCE. In World War II, Beckett participated in the French Resistance to fight against the Nazi occupation of France. Translating documents and using his apartment as an information drop, Beckett risked arrest to fight the Nazis. After some of his friends in the French Resistance were arrested, he fled to the south of France in 1942, but he continued to help the movement. The French government later gave Beckett the Croix de Guerre (Cross of War) and Médaille de la Résistance (Medal of the Resistance) for his courage. 10. HE MADE A WEIRD MOVIE WITH BUSTER KEATON. Beckett wrote his only screenplay in the early 1960s and cast a 70-year-old Buster Keaton in his movie, called Film. Released in 1965, Film portrays Keaton in a city, trying to hurry past others on a street, and in a room with various pets and a lone piece of artwork. Highly experimental, Film got mixed reviews, and Beckett described it as an interesting failure. 11. HE WON A NOBEL PRIZE, BUT WASN’T SUPER HAPPY ABOUT IT. In 1969, Beckett won the Nobel Prize for Literature for his innovative novels and dramas. When he and his wife found out that he had won, she said, “Quelle catastrophe!” (What a catastrophe!) because she knew that her husband didn’t like to be in the spotlight. Because of Beckett’s dislike of fame and publicity, he refused to accept the Nobel Prize in person so he wouldn’t have to give a speech. Beckett’s publisher accepted the award on Beckett’s behalf, and Beckett gave away his prize money, mostly to the library at his alma mater, Dublin’s Trinity College. 12. THERE’S A VERY COOL BRIDGE NAMED AFTER HIM IN DUBLIN. In December 2009, Beckett’s nephew and niece were present at the Samuel Beckett Bridge opening ceremony in Dublin. Suspended over the River Liffey, the bridge has a series of 31 cables that make it look like a giant harp. Designed by architect Santiago Calatrava (who also designed the nearby James Joyce Bridge), the Samuel Beckett Bridge accommodates car and pedestrian traffic.